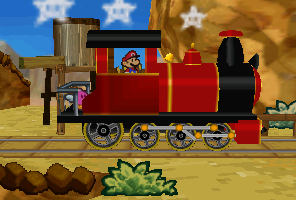 Dry Dry Railroad is a train line used in Paper Mario. 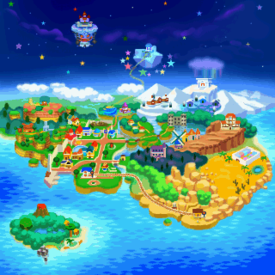 Its one end is in the south part of Toad Town. Its other end is at the foot of Mt. Rugged. To ride it, Mario must destroy the rock blocking the railroad with Bombette. The ticket master thanks Mario for his effort and gives him a free pass to ride the train, K64. After riding, he reaches his next destination, Mt. Rugged. The Toad near the bulletin board in Toad Town talks about Dry Dry Railroad. There is also an advertisement sometime in that bulletin board. There is a Star Piece to the south of the east end of the railroad in Toad Town. This page was last edited on October 23, 2018, at 21:31.